The decision to adopt your first cat is a monumental one, both for you and for your new cat, which I hope will be a family member for life. Whether you are thinking about getting a cat, or have just adopted your first one, this tutorial has been designed to make your relationship with this special cat a lasting one. This is what we mean by the term "a forever home." Bringing home a new cat is much like adopting a human baby. However, in the case of a cat, you'll be shopping for a litter box instead of a changing table. 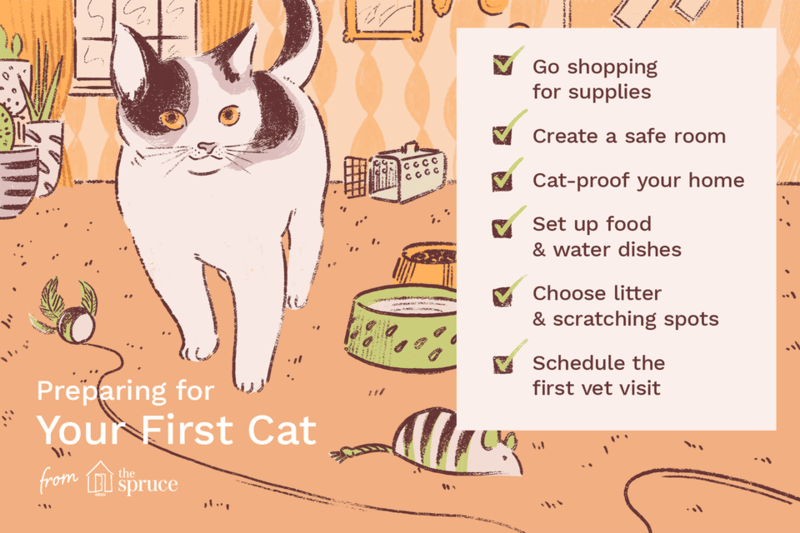 Before you bring your new cat or kitten home, there are a number of things to collect or buy, so your cat will feel like a family member rather than a visitor. Do this a few days in advance to minimize stress for you and your cat on "homecoming day". In the excitement of bringing your cat home, you don't want to suddenly discover at 8 p.m. that you forgot to buy cat food. A "Safe Room" needn't even be a separate room, but could be an empty closet, a corner of your bedroom with a protective screen, or a seldom-used bathroom. The important thing is that your new cat has a place he can call "home," where he can retreat and rest. He may voluntarily choose to socialize with you and other family members, but for now, let him decide whether to hide or mingle. It may take several days to a week or more, depending on his history, but your patience at this point will yield exponential results in a happier relationship with your cat in later days. You've decided where you're going to go to adopt your new kitty; possibly you've already narrowed your selection down to one cat you simply must bring home. You've stocked up on essentials from our shopping list, and you've prepared kitty's "safe room." There's only one step left before Homecoming Day - Cat-proofing your home to save wear and tear on the household as well as the new arrival. Although it will take a bit of time, cat-proofing your home isn't rocket science. It only requires your willingness to get down to a cat's level to spy out hazardous temptations, along with the ability to think like a cat. O Happy Day! You've completed all your preparations and the big day has finally arrived for bringing your new kitty home. Although everyone is excited, it's probably better not to make this a big family event. Your new baby will probably be stressed enough without a bunch of people competing for his attention, especially if you have young children in the home. Your new cat's first veterinarian visit is of supreme importance. You'll want to assure yourself of his good health, and get his vaccinations and testing for FIV and FeLV (if not already done by the adopting agency). Also, unless this has already been performed, you need to set up an appointment for a spay or neuter of your new cat. Prepare in advance for the possible question, "Do you want a declaw with that neuter?" The correct answer, of course, is "No, thank you. My cat needs his claws and I intend for him to keep them." The diet a cat gets early in life will set the pace for his lifelong health and well-being. Your knowledge of cat food ingredients will help ensure not only longevity but the quality of life you want for your new family member. Although cats descend from desert creatures, fresh water is also essential to them, especially if they eat a dry food diet. Although this class is presented in one lesson, the content is something you should review for weeks and months ahead, until you feel secure in your knowledge. Once you learn to read cat food labels it will become a habit for life. A source of clean, fresh water is also vital to your cat's well-being. Although cats have descended from desert animals, they still need to be well-hydrated. Next, to food and water, a litter box is critical for your new cat's comfort and health. With scrupulous maintenance of your cat's litter box, you'll never have to worry about odor or "out-of-box accidents." "But he goes outdoors," you say? You'll want to rethink that decision when we cover the indoors-outdoors debate in another lesson. Another big consideration with your first cat is "where will he sleep?" Will you share your own bed with him, get him his own cozy bed, or a combination of both? Don't forget, you are establishing habits that will most likely last a lifetime. Next to litter box avoidance, undesirable scratching behavior is the top reason for shelter surrenders. Actually, scratching is as necessary to cats as eating and breathing. Cats' claws are their most essential tools for many reasons. When you complete this lesson, you'll have all the tools you'll need to ensure your cat the scratching, stretching exercise he needs, without sacrificing your hard-earned carpet and furniture. Playing with your cat is a wonderful bonding experience. Cats love to play and are experts in inventing their own games. Before you invest in expensive cat toys, experiment with things found around the house. Paper bags are great fun, as are cardboard boxes. Jaspurr, pictured here loves to play "box sled" and will let Lance drag him around the floor for hours. As you can see, he is very serious about his play. Indoors or Outdoors for Your Cat? For most of my life, my cats were allowed outdoors. That was the norm in the era and area I lived in. My epiphany came when I realized that my Shannon's FIV was the result of fighting with an infected neighbor cat when he was younger. I hope you will learn from mine and others' experiences, and never have to face the cold, hard truth by losing a beloved cat. If you feel that cats really need that fresh air and the sunshine, there are safe alternatives for the outdoor experience. My Jenny is perfectly happy just sitting on my lap on our deck. She never wanders out of my site, and our deck is secure from intrusion by other animals. I have no doubts that if you have stayed through this entire tutorial, you are already developing bonds of love with your cat that will last beyond death. 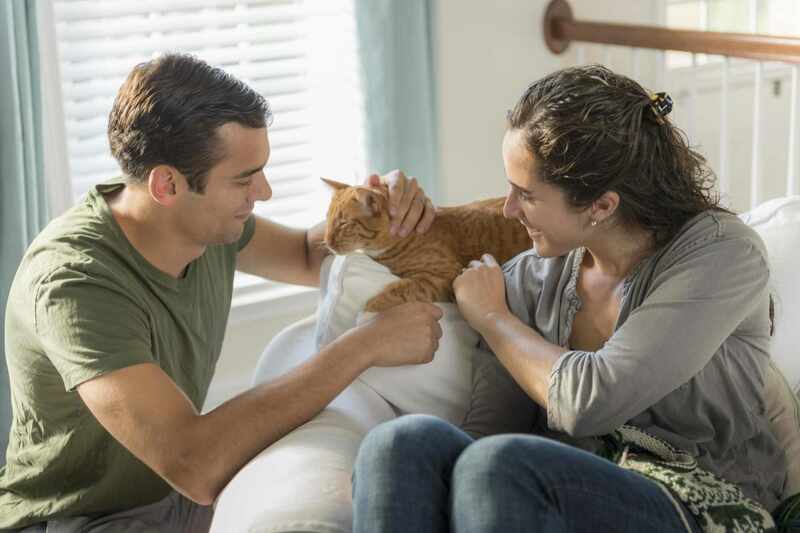 As time passes, your bonding will become stronger than ever, and you and your family will consider your cat a valued family member rather than a pet. Congratulations for caring enough about your cat to stay the course! Today is graduation day and you can officially call yourself an ailurophile, or even a crazy cat lover. You are joining a group of the most wonderful, caring people in the world: those who adore their cat children.